Click here for retail locations. 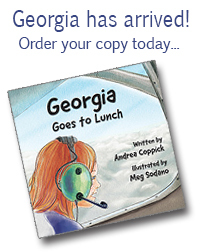 Georgia Goes to Lunch is the first children’s picture book authored by airline pilot and philanthropist Andrea Coppick, with illustrations by natural science and children’s book artist Meg Sodano. Georgia Goes to Lunch is an inspirational and educational story for children embarking on their first adventures of life. Georgia is a fearless 7-year-old who loves to observe the world from the trees and rooftops of her neighborhood. She can keep herself entertained for hours just taking in the sights and sounds of people and animals down below. On one unassuming day, Madeline, a friend of Georgia’s mom, drops by to tempt them with a lunch outing. Georgia thinks very little of it at first, but is soon swept away to an intriguing little airport. What might have been a simple cheeseburger at the neighborhood diner turns into a magical aviation adventure as Georgia realizes the day that’s in store for her. Georgia Goes to Lunch is an ideal book for any child who has a thirst for knowledge and an insatiable curiosity. 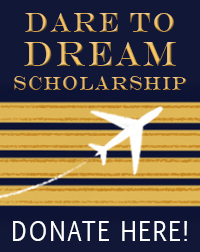 If you’d like to introduce the concept of aviation to your child, look no further. Purchase a copy and share it today! 20 pages of story with digitally created illustrations.